The “Say Hey” Kid, the incomparable Willie Mays. A striking, unique photo by photographer William Jacobellis (and a tip of the cap to Weingarten’s Vintage great classic MLB photo Twitter) for many reasons: It’s in his rookie season of 1951 (with the telltale NL 75th Anniversary patch on his left sleeve, worn by all teams of the Senior Circuit that year), it’s at the Polo Grounds, it’s taken from an unusual but intriguing angle – and, most unusually, he’s not smiling! His serious gaze would soon brighten into beaming confidence and joy as Mays (not even coming up to the big club until late May, his .477 AAA average forcing the Giants’ hand) would crack 20 HRs to earn 1951 Rookie of the Year honors (interesting note – his first ever hit was a HR at the Polo Grounds off future HOFer Warren Spahn). 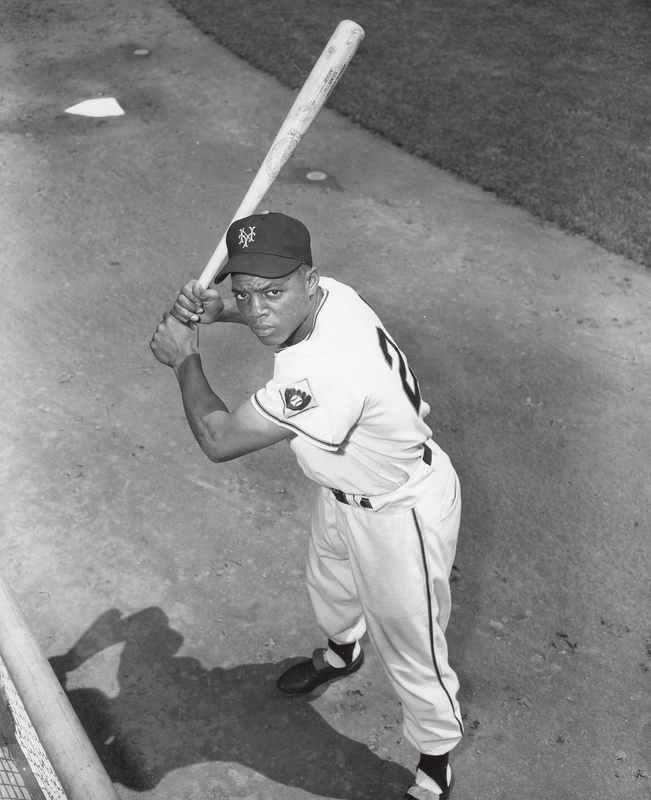 Mays as a rookie in 1951 also participated in one of the most exciting Octobers in MLB lore, being on deck when Bobby Thomson hit the “Shot Heard ‘Round The World” to win the pennant for the boys from Harlem over the Brooklyn Dodgers, and, while the Giants lost, the 1951 World Series highlighted the first all African-American outfield in MLB history (with another NY Giant legend, Monte Irvin, in left, Mays in center, and Hank Thompson in right), and also saw Mays competing against Joe DiMaggio in his final season. As most baseball fans are aware, Willie Mays was among the finest ever to play the game. Often considered the first, and most talented, “five-tool” player (hit for average, hit for power, speed, throwing arm, good glove), his accomplishments are stunning: despite missing almost two seasons (mid-1952 to 1953) to military service (and returning from it to lead the league in average and slugging to win the 1954 NL MVP and lead the Giants to a World Series championship), he amassed 660 HRs, 12 Gold Gloves (tied for most all-time – his over-the-shoulder catch deep in the Polo Grounds center field in Game 1 in the 1954 World Series widely considered the best defensive play of all-time, forever known as “The Catch”), not to mention 24 All-Star games (also tied for most all-time; a guy by the name of Ted Williams once said, “They invented the All-Star Game for Willie Mays.”). Starting out as one of New York City’s biggest sports stars, he continued to shine after the Giants’ move to San Francisco in 1958, and became a beloved icon there as well. He returned to New York at the tail end of his career as a New York Met in 1972, and retired after the 1973 season, but not before participating in the 1973 World Series and garnering his 4th NL pennant. The legendary Dodgers’ announcer Vin Scully (as well as numerous former MLB players) states unequivocally that Willie Mays was the best ballplayer he’s ever seen. As I was lucky enough to see a Mets game or two in my youth with Willie Mays in the lineup, and while my memory is cloudy, I’m confident that I can echo the same sentiment. Say Hey! Great read. I’d almost forgotten his last few years at Shea.